First Look: “I Do” or “I Don’t” Why you should consider a First Look! Fast forward to 2019, and although some couples still like to practice tradition, many have expressed they feel they would enjoy, and even benefit from sharing that moment privately with one another. We talked to wedding expert, Jess to hear some of the greatest pros & cons she has come to find about first look. 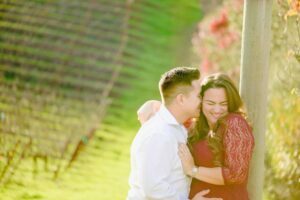 By scheduling a time for a photoshoot before the ceremony, you will have more time to relax throughout the day, as most of your photos will already be completed. Many couples find first looks to be a fantastic idea, as it allows them to spend more time with each other on their big day. A wedding day is full of nerves and anxiety on both sides, having a first look can help relieve these overwhelming emotions before the ceremony begins. For some couples, it’s hard to contain their emotions on their big day. Having a first looks allows them time to compose themselves before the ceremony begins. With the extra time saved by taking photos before the ceremony, the couple is able to join their guests during cocktail hour if they please. Many couples opt out of a first look because they value the tradition of sharing their special moment at the alter in front of all their guests. With squeezing a first look into your already hectic wedding day schedule, you’ll have to wake up earlier and get ready sooner so the shoot can be completed in enough time before the ceremony. Some people have stated that a first look can build pressure to have a good reaction, when some people aren’t as expressive with their emotions. LIVE Q&A at 8pm est.